This is a perfect one-pot meal! Serving the pesto chicken over spinach is a great way to get in one more serving of veggies, plus I love how the hot chicken slightly wilts the spinach. It’s fresh, but comforting. 1. Heat 1 Tbsp olive oil in a large skillet over medium heat. Add the chicken, sprinkle with salt and pepper, and cook about 8-10 minutes or until chicken is browned and cooked through (no longer pink). Remove chicken from pan. 2. Add the remaining tablespoon of olive oil to the pan. Add green beans and cook about 6-8 minutes, or until crisp and tender. 3. 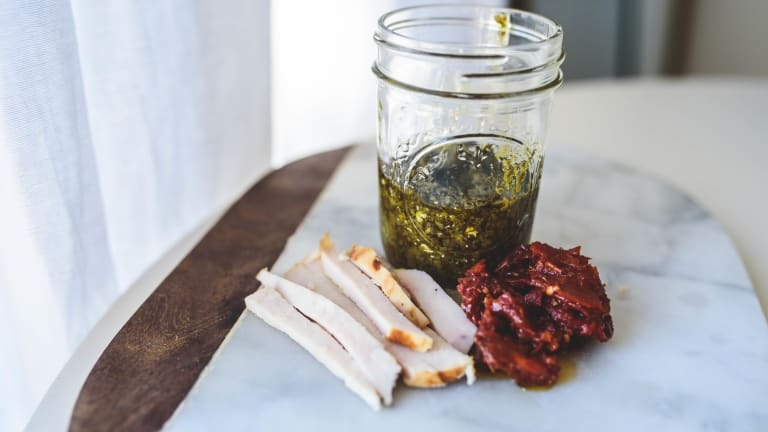 Return the chicken to the pan and add the pesto, sundried tomatoes, and feta. Stir to combine and cook 2-3 minutes longer until heated through. 4. Serve the pesto chicken on a bed of fresh spinach.